Adjustable cheekpiece for AR match rifles, designed to clamp around standard buffer tube, requires installing bolt handle on bold carrier. 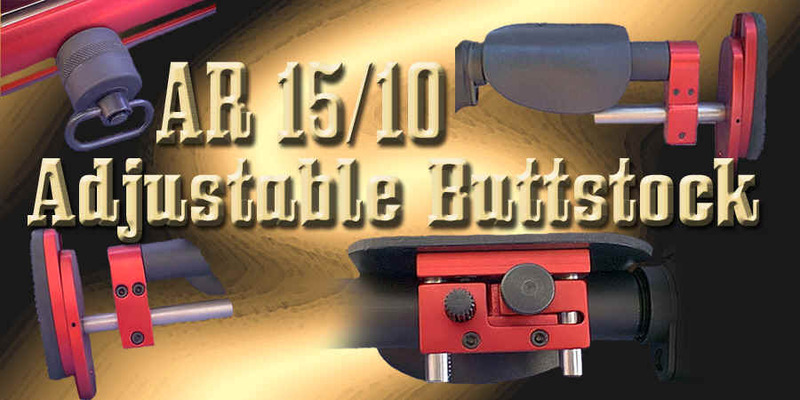 Complete buttstock assembly for match rifle includes both AR-BP & AR-CP (or ARHWCP) as well as a special buffer tube that is a heavy steel body to aid in balancing the rifle. The stock is also 1-1/2" shorter than an AR buttstock. Includes shorter buffer and spring. rifles with the NEW FLIP-UP CHEEKPIECE. out of the way, so that a slightly modified charging can be used WITHOUT CHANGING THE UPPER RECEIVER.